PEBBLE BEACH FLOORPLAN: Our Pebble Beach Model is now for sale!!! Beautifully appointed interior and concrete block construction with additional sound proofing allows privacy and a peaceful lifestyle. Beautiful, tranquil views of lake and fountain. Upgrades!! Gas stove, dryer , tank less hot water heater. Walk up the grand staircase, or ride in your private elevator. This home feels like a single family home. Large door casings and baseboards add to the up-scale elegance of this open plan. Dramatic ceilings vault from 10'-14' with 8ft doors. In the great room, a 12' x 8' glass sliding door disappears completely against an exterior wall. Price includes a 5% year-end purchase incentive if closed by Dec. 31, 2018. Purchase includes Social Membership to two championship golf courses. 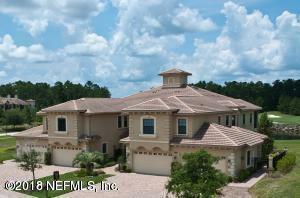 Listing courtesy of Deltona Realty At St Augustine Shores.